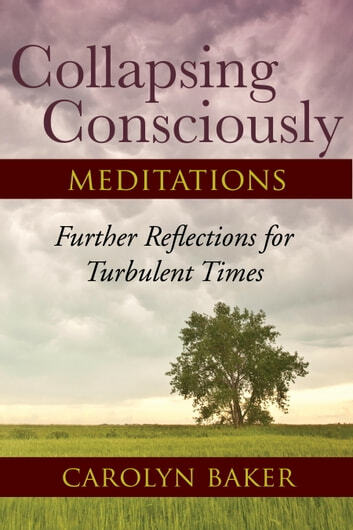 As a companion to the book Collapsing Consciously: Transformative Truths for Turbulent Times, these additional meditations are for readers seeking profound emotional and spiritual preparation for the impending collapse of industrial civilization. Collecting more than 300 meditations, author Carolyn Baker weaves together spiritual wisdom, inspiration, humor, and a persistent challenge to create and savor beauty in the world, regardless of how bleak the future may appear. This book offers wisdom, inspiration, and a sense of spiritual purpose for anyone who is concerned about the daunting future humankind has created. Instead of quoting discouraging statistics about our predicament, Baker offers a deeper perspective that makes sense of a world that most of the time appears psychotic or even surreal. Through inspiration and perennial wisdom she has created a manual for making meaning and generating joy, especially in situations that feel hopelessly devoid of both. Also available: Collapsing Consciously: Transformative Truths for Turbulent Times, ISBN 978-1-58394-712-8. Plus de titres de Carolyn Baker, Ph.D.